The biggest mouth in the kitchen, Chef Gordon Ramsay, is back for an all new season of Hell’s Kitchen. The tasty competition starts tonight on FOX and I am excited and hungry to see what gets cooked up. With chef Gordon Ramsay at the helm there is always more insanity and drama than one sees on most reality TV. Stay tuned as we live blog the premiere episode with all the up-to-the-minute details and action. Tonight’s episode features part one of the two-part Season 10 premiere of Hell’s Kitchen. This first-time opening double header shown over 2 consecutive nights pits 18 aspiring restaurateurs against each other as they bravely attempt to impress Chef Gordon Ramsay and quell his fiery anger and outbursts. The contestants compete in an intensely competitive culinary academy to prove they possess the right combination of ingredients to win the life-changing grand prize: a head chef position working under Executive Chef Kevin Hee at Gordon Ramsay Steak at Paris Las Vegas. In the first team challenge of the season Chef Ramsay asks the contestants to prepare their signature dishes and splits the chefs into two teams: men vs. women. The winning team gets treated to a delicious dinner prepared by Season Three winner Dave Levey and Season Six winner Rock Harper, while the losing team is left behind to scrub down the kitchen in preparation for their first dinner service. During opening night service of Hell’s Kitchen, the teams begin to fracture and mistakes are made before the first course is served. Find out which contestant is eliminated in the all-new “18 Chefs Compete” by following our up-to-the-minute live recap right here at CDL on this post. We will be live blogging tonight’s episode with all the excitement, so don’t forget to come back to this spot at 8:00 PM EST to spend the evening with us. Make sure to refresh often to get the most current results! While you wait for the recap, check out a sneak peek of tonight’s episode below. One thing that Chef Ramsay has brought to gourmet cooking is 4-letter words – Enjoy! RECAP: 132 hopefuls have walked through the Hells Kitchen doors and only an elite nine have a taken the victory. 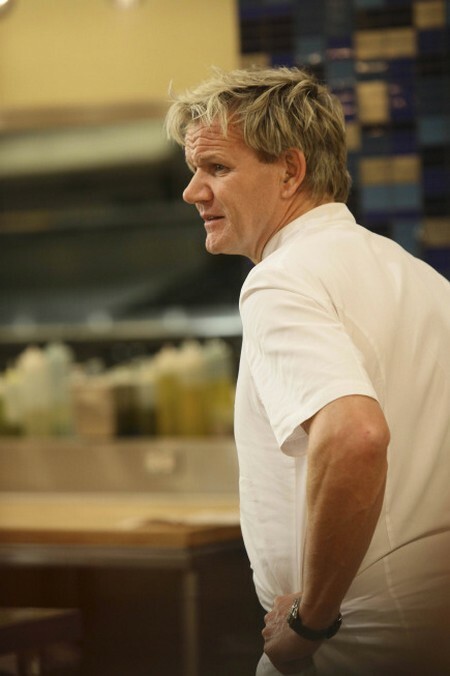 Tonight Hells Kitchen is turning 10, with Chef Gordon Ramsay putting everything on the line. This season there will be many more fights in the dorms, the parking lots and especially in the eliminations. Ramsay will push this season further than any other, but not as hard as they will push each other. Time for all of Chef Ramsay’s new round of victims to arrive in Hells Kitchen. Sous chef Scott is the first person to greet them and he is going to test their commitment. When he first met Chef Ramsay he had hair, he shaved it for Chef Ramsay and wants to know who else is going to make the commitment. Sous chef Andi also got her head shaved, then a few hopefuls volunteer but Chef Ramsay puts a stop to it and tells them all to prepare their signature dishes, they have 45 minutes. The hopefuls are divided into two teams, men versus women. It appears that Andi didn’t shave her head, she was wearing a bald wig. Chef Ramsey announces that the winner will work at Gordon Ramsay Steak at the Paris in Las Vegas, salary of $250,000.00. Scores for the individual teams: the women 5 and the men 3, the women rule and the boys drool. The men have to clean both kitchens. The women are going for a superb steak bbq and cooked by former Hells Kitchen winners Rock and Dave. The men finish an exhausting day of cleaning and take the time to go over the menu for dinner service. Meanwhile, the women are a bit tipsy and fooling around, will it affect their dinner service? It’s a big night, the 125th dinner service. Chef Ramsay tests Briana and asks what entrees they are serving, but can she do it? Yes she does. What is it about these chefs that year after year they can’t cook scallops? On the women’s team, Roshni gets thrown off the fish station for her lousy scallops. The men are serving raw meat, so no appetizers have gone out yet for them. Chef Ramsay is pissed, the men’s scallops are all broken, completely mutilated by Tavon. Meanwhile, Christina is killing the Beef Wellington on the women’s station. Royce gets thrown out of the kitchen crunchy spaghetti and the men are still a mess with the appetizers. Chef Ramsay completely loses it and sends all the men back to the dorm full of embarrassment. The women are still focusing on their Wellingtons, Chef Ramsay shuts it down. Time for elimination, 100 diners, 18 chefs and 0 entrees served. The losing team is the blue team (men). Chef tells them that they sucked and he wants them to pick two chefs that should come up for elimination. Time to see who gets to be the first man to leave Hells Kitchen. Patrick nominates Tavon and Don. Chef Ramsay is not happy about the choice, he picks Tavon and Royce who claims that he was sabotaged by Guy. Chef Ramsay tells the two that they turned this evening into a disaster and Royce is going back in line, Tavon is eliminated.